If you’re actively creating email campaigns you know email templates are a critical part of your efficiency. And there’s really no doubt about it. Creating a reusable email template saves you time. But do you ever feel like your reusable template is starting to get stale? You want your emails to have a consistent look and feel, but worry your tried-and-true email design is starting to feel tired. As the majority of people now read their email on a mobile device, a mobile responsive template is no longer a luxury — it’s essential. A mobile responsive email adjusts itself automatically to the dimensions of the device it is being viewed on. This is different from a mobile-friendly template, in which your emails do not adjust based on the screen size. If your emails are not yet optimized for mobile, it’s time to update your template. Keep your audience engaged by offering timely content with a new look for the holiday season. This tells your audience that there is a person behind your emails, not a robot mindlessly pushing out generic content. Need help coming up with holiday email ideas? We’ve compiled 30 creative ideas for you. If you’ve noticed that metrics like your click-through rate have gone south, your template may need to be reinvigorated. When your subject line is sensational, your content is engaging and you’ve positioned yourself to actually get noticed, but still aren’t getting the results you want, poor design may be the culprit. Reengage your audience with a fresh new template. Use these seven essential elements of email design as your guide. Perhaps you recently decided to start marketing your business to millennials. Maybe you realize that seventy-year-old sailors can’t get enough of you. Either way, whenever you’re trying to engage a specific audience segment, it’s a good idea to create a reusable template directly tailored to this specific audience. If you’re not carefully segmenting your email list, you’re missing the opportunity to connect with people in a targeted, meaningful way. When creating a template for a specific group, keep your message focused and only include the information that’s relevant to them. Even if there aren’t any major warning signs your template needs a refresh, it’s a good idea to keep your look and feel fresh. Not sure where to start? Send an online survey to ask your customers what they’d like to see in your next email newsletter. Including them in the process will make them feel invested and eager to see your new look. Now that you know all the warning signs, take a hard look at your template today and see if it could use a makeover. If so, dust off Constant Contact’s guide for creating a reusable template, and get to work. 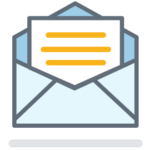 Have questions about your email template we didn’t cover? Let us know in the comments!